Rice is basically a staple in my diet. I love rice, always have, and always will. For some reason, there is usually leftover rice. Growing up, we regularly ate it, and now in our home, it’s the same, with the perpetual question of what to do with the leftover rice. Well, you can throw it out for one thing. And if it was more than a couple of days old, I would do so. (My thoughts on left over food will come another day, but long story short, I'm not a fan.) You can eat it plain with some veggies, mix it with quinoa, or you can turn it into fried rice! This traditional Gujarati (a sub-area of India) fried rice dish was one of my favorites growing up. It's pretty simple in that you can add whatever veggies you want, and then just sauté it in some cumin and mustard seeds. I took it up a notch by mashing some avocado in this dish. Avocado is an amazing little fruit. Packed with healthy fats and proteins, it’s a great addition to any dish. From an Ayurvedic perspective, avocados are good for almost anyone. They're nice and cooling for the pittas and super grounding for the vatas. It's also a great help for anyone with dry conditions and a good source of healthy oils for the body. If you have a dry or irritated GI tract, avocados are a great support. This dish is super easy to make. Whether you have some rice in the fridge, or you are whipping up a new batch, this really won't take long at all! P.S. I absolutely love putting fresh fennel root into this dish. Bon appetite! 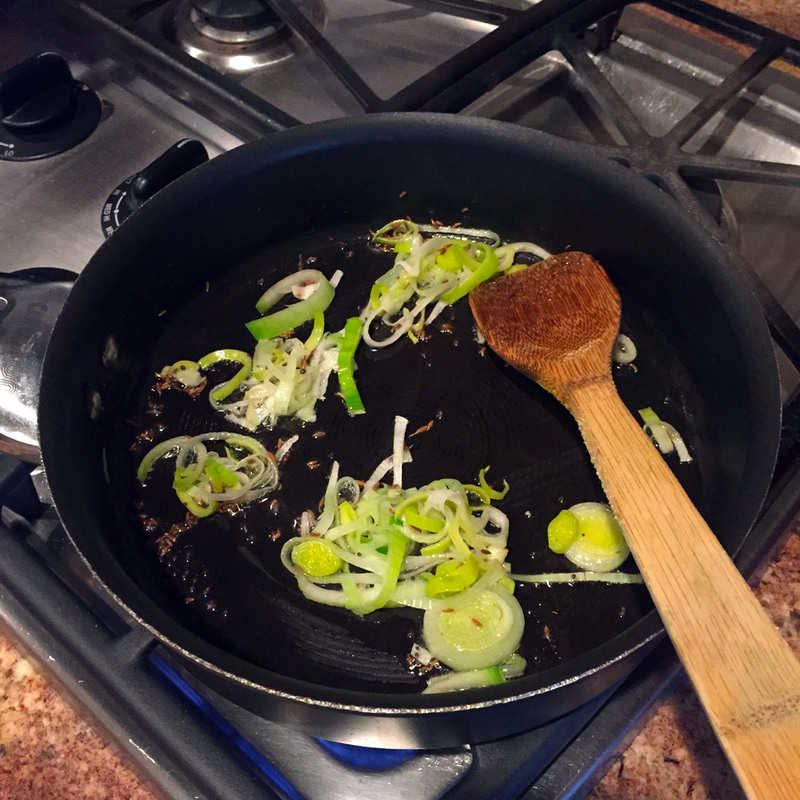 Warm the oil in the pan and add cumin and mustard seeds, and cook until they begin to sizzle and pop. Add the leeks and really cook them down until they are nice and soft. Add the rice and coat thoroughly with the oil and leeks. Add the turmeric and chili powder, and again make sure you coat everything thoroughly. Cut up the avocado and mix it in to the rice. Make sure you really mash the avocado completely in to the rice. It may take a while to do this, but don't worry about crushing the rice. Nothing will happen! Serve with slices of lime and enjoy! Nishita is passionate about holistic living, and integrating all that the universe gives into her life. She loves everything and anything regarding food—literally. You can generally find her in the kitchen testing out some new and wacky dessert recipe or figuring out ways to incorporate various herbs into the foods she makes. Outside the kitchen, she loves spending her time in nature or on her mat doing her daily sun salutations. Nishita is an Ayurvedic Studies Program levels 1 and 2 graduate from the Ayurvedic Institute, where she studied Ayurveda and Yoga under the world-renowned Vasant Lad, BAM&S, MASc. Check out her website, www.nourishthefire.com for more fun recipes!